Athyrium (lady-fern) is a genus of about 180 species of terrestrial ferns, with a cosmopolitan distribution. It is placed in the family Athyriaceae, in the order Polypodiales. Its genus name is from Greek a- ('without') and Latinized Greek thureos ('shield'), describing its inconspicuous indusium (sorus' covering). The common name "lady fern" refers in particular to the common lady fern. Athyrium species are used as food plants by the larvae of some Lepidoptera species including Small Angle Shades and Sthenopis auratus. ^ Alan R. Smith; Kathleen M. Pryer; Eric Schuettpelz; Petra Korall; Harald Schneider; Paul G. Wolf (2006). "A classification for extant ferns" (PDF). Taxon. 55 (3): 705–731. doi:10.2307/25065646. Archived from the original (PDF) on 2008-02-26. ^ Maarten J. M. Christenhusz, Xian-Chun Zhang & Harald Schneider (2011). "A linear sequence of extant families and genera of lycophytes and ferns" (PDF). Phytotaxa. 19: 7–54. ^ Lloyd H. Snyder, Jr.; James G. Bruce (1 October 1986). Field Guide to the Ferns and Other Pteridophytes of Georgia. University of Georgia Press. p. 114. ISBN 978-0-8203-2385-5. Retrieved 26 September 2013. 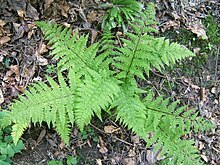 ^ Entry "lady fern", New Oxford American Dictionary 3rd edition (2010) by Oxford University Press, Inc.
Wikimedia Commons has media related to Athyrium. This page was last edited on 27 November 2018, at 20:40 (UTC).